I've brought up Ralph Lauren before (just click here), but I think a couple of things need to be said again. In these 'trying times' - we look at stories of 'success,' stories that highlight the American Dream, and stories that demonstrate that through hard work we can accomplish a great deal. But sometimes (hey, practically most times) these success stories are built upon the backs of unnamed people. For Ralph Lauren, it's Native American people. Lauren frequently uses Native themes in his collections to reference ideas of the West and of ‘the frontier.’ He is well-known for his 'Americana' collections, and his Polo shirts embraced an idealized aspect of the American experience. His Santa Fe collection was added to the brand in 1981, providing 'Navajo-inspired' designs that were a global success. It has been noted that Lauren has probably done more than any other designer to romanticize the Native American Southwest. And romanticism is one thing, but Lauren does something that ... how does it go?.. gets in my craw? Yea, that. 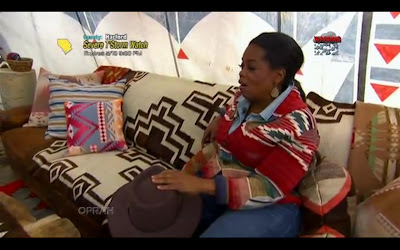 So, needless to say I was particularly excited for the RL episode, Oprah even says that this was a major 'coup' for her. 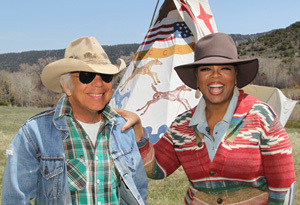 "Known for his timeless collections filled with extreme tailoring contrasted with rugged sports looks, Ralph Lauren gives Oprah an insight into his creative lifestyle." Creative lifestyle? Psh. (I'll get to that in a second). I watched the whole thing. And one hour later, something was irritating me. 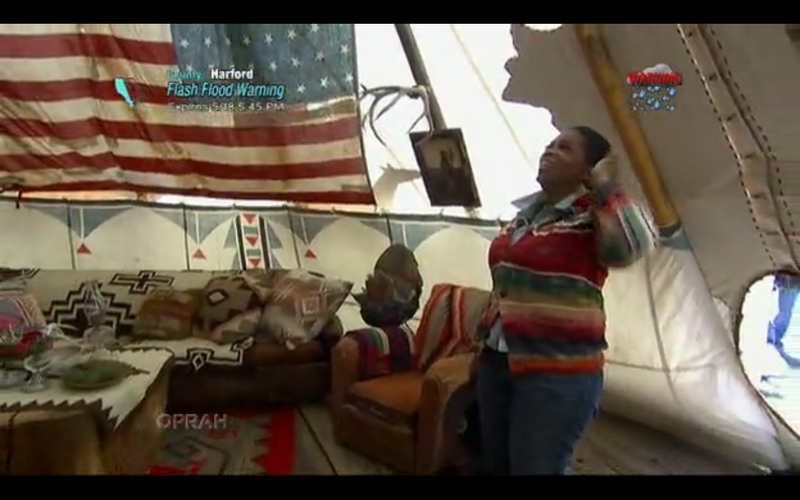 OPes: "Do you collect all these old blankets?" 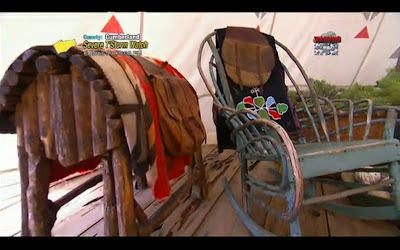 Ralphsy: "Yes always collected blankets, and all the Navajo stuff." OPes: "I can't shut my mouth. This is a dream." Where to begin? 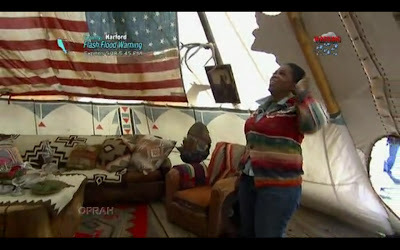 Well, first, Lauren name drops Navajo (so hot right now), but, Oprah and Lauren are in a teepee. Navajos don't live in teepees (hogans, hello). 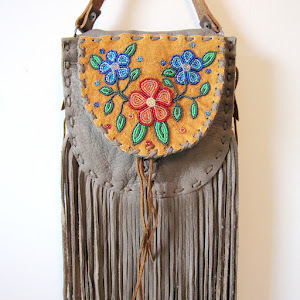 And they don't do floral Woodland beadwork (see above), that would be the Woodland tribes (duh). Second, these aren't all 'old blankets' - they look like new Pendletons to me (see below). And that's a different story. 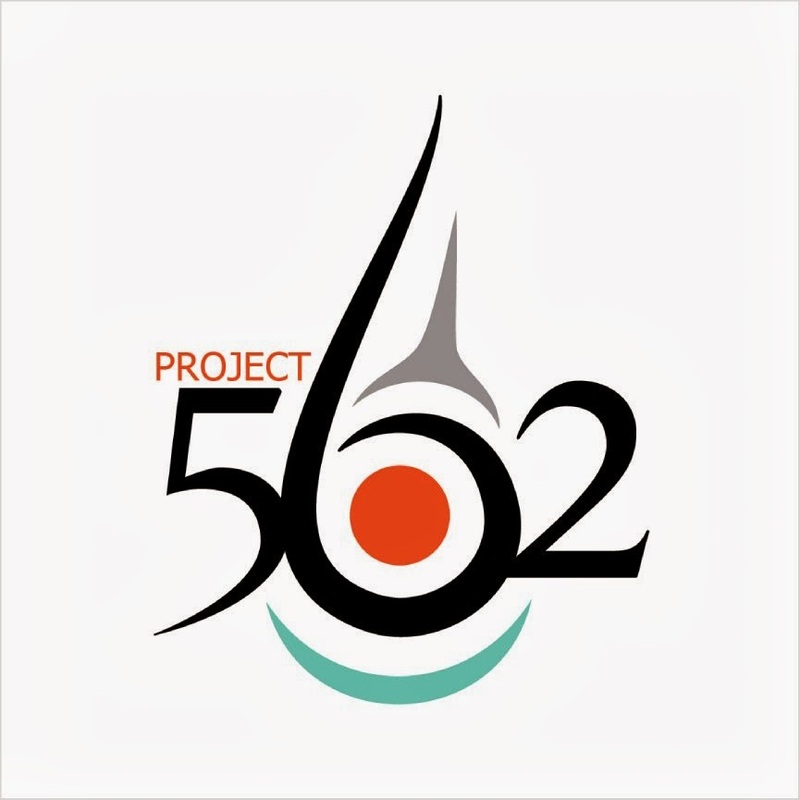 Third, let's talk about the American Dream and land ownership and how that connects to the displacement of hundreds of Native nations and, in the Plains, the removal of Native people from their traditional teepee homes into log cabins (it's a little thing called the reservation era, folks). And then we get to see this screen shot (at about the 3-4 minute mark). And right away, the first question that pops into my head is "Who is that little girl?" It's like the ultimate form of appropriation. That little girl is someone. She's someone's daughter, sister, antie, niece, mother, cousin, granddaughter, grandmother. With greater accessibility to photographic collections, Native people are starting to reclaim the images of their family members that have been held hostage in archives for over 100 years. On Facebook, I see friends post pictures of their great-grandmothers, their great-uncles, people who served as leaders of their communities, their relatives. These are images of people we know - or worse, of relatives and children who we don't know because they have been taken away through government boarding school policies. So what is Lauren doing with this picture? It's like when you go to Target and buy a frame, and decide to keep the picture of the happy couple in it instead of putting in your own picture. Why would you do that? You wouldn't. You might buy a picture at Target and keep it in the frame if it was an art image. So, are we no longer people with names? Are we just... decorative? Something to be consumed? Sold? Flaunted as status symbols and of achieving the American Dream? Oprah talks about this 'American Dream' (at the 11 minute mark). RL’s parents were immigrants from Russia, looking for a better life in America. Through the process of becoming 'American,' he changed his name from Ralph Lifshitz to Ralph Lauren. He cast aside his cultural, ethnic, and religious background and went on to build an empire based on appropriating and selling Native American cultures and artistry. And this, I guess, is a success. During the interview, he stated, “I feel that I represent America.” Yes you do, Ralph, and that is not a good thing. In sum, the way that Oprah positions and defines the American Dream actively excludes and oppresses Native American people and their cultures, and disregards and devalues Native Nations. I mean, you can't achieve the American Dream with Native Nations' rights to their own land and intellectual property standing in your way. 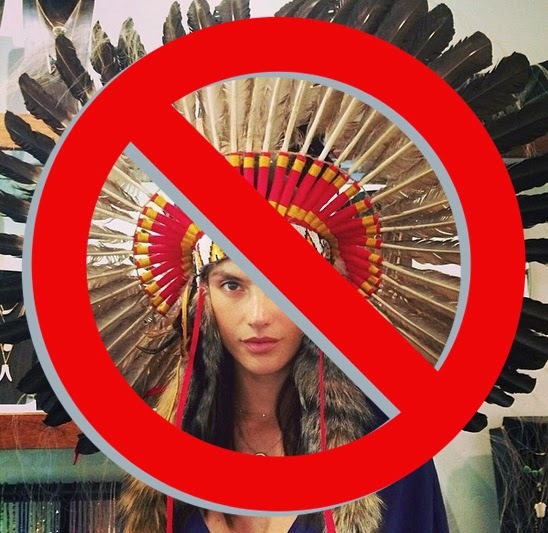 Unfortunately, this is one of the best examples of negative American Indian cultural appropriations i've ever seen. One that clearly depicts the devastatingly ignorant perspective of our culture as "Americans". There are two sides to every story as there are two sides to every leaf. Although Ralph Lauren may have raised "some" unintentional awareness regarding American Indians perhaps born from a deep inspirational influence and affinity for the South Western image that so many Europeans do, it's being released into a sea who's negative waves of consumption move stronger than those of positive change. "Is it really that bad?" Art, fashion, design and American Indian culture is beautiful yes, and should be shared yes, but as in all of nature's laws, even in the arts, one must take responsibility for "claiming" their crafts to "represent" an entire country especially when it involves a culture that was (and still is) being brutally abused. The hardest part.... "they're not trying to hurt anyone" but in the end, if you make millions of dollars based off of someone else's "design" or culture without even giving back a penny, you are. Unfortunately the anger fueled by the lack of respect depicted by major commercially driven industries such as Ralph Lauren usually leads to "reverse racism" merely perpetuating the vicious cycle. It is not in our place to tell others how to live or what to do but it is all of our responsibility (especially those that share the American Indian culture at heart) to educate those around us about our "current" situation and inspire positive change. Well here's my two cents - Being American Indian I'm divided on this issue. The positive: RL & OW have brought to the forefront the beauty of American Indians through design, which I believe brings awareness and curiosity. 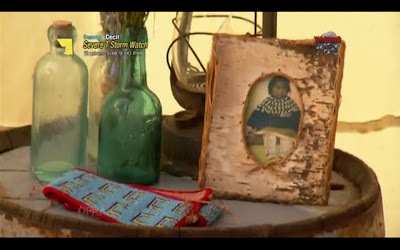 As a designer after this episode aired my sales doubled. I agree with Dr. Metcalfe, too many people take without asking it’s been happening for 500 + years to Indigenous people. I admire RL and his success in America, but we do live in a free country where there is nothing new under the sun as all cultures have borrowed from one another. Great points Carol, but, as I mention above, living in 'free country' and buying into the 'American dream' "actively excludes and oppresses Native American people and their cultures, and disregards and devalues Native Nations." You are so right on about the appropriation dilemma, the pinnacle of it being the picture of the little girl (!!!!) but as Carol wonders... where can we find a balance? because cultures are constantly borrowing from one another. 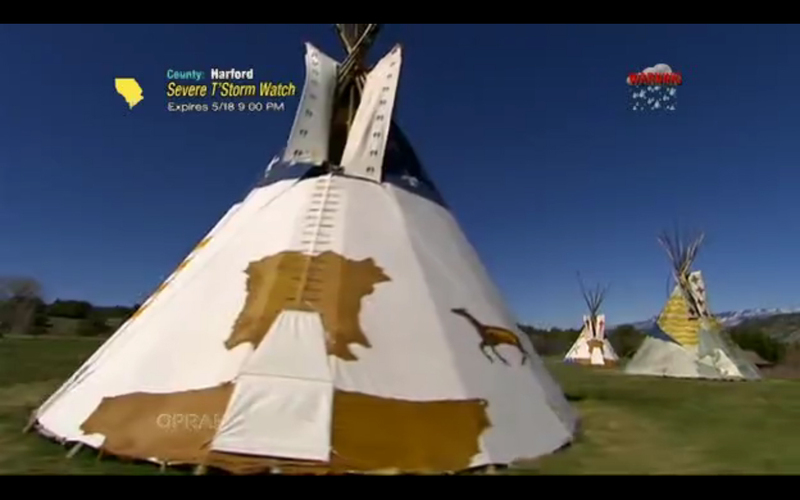 PS: my four-year-old is dying for a toy teepee to play in- where can I buy an authentic one? Is it wrong to order it online from magiccabin.com or such? Maybe you can feature them on your boutique? Thanks again for the good content. The saddest part about all this, imho, is how little attention Oprah paid to real Aboriginal people and our issues in her program over the years and on her new network. It is like we barely exist in her mind. She doesn't seem to care about the real, living Indian - but she sure likes the artifacts and commodities - and her rich friends who exploit the same. But let's face it, her primary audience is white middle-class women and they are the ones who buy Ralph Lauren. And this is why Ralph Lauren's designs have always seemed both boring and fake to me and why Oprah drives me nuts. I couldn't quite put my finger on it but now I am seeing why. I can't stand either of them, to be honest. For a designer, give me Vivienne Westwood. lol for a tv personality...I'll get back to you on that. Oprah's attitude reminds me of a story I heard about a European local greeting one of the former barons after WW2. He bowed and scraped his foot, sickening. Its time to stop fawning over the rich and demand dignity for all.